Porsche make one of the most practical sportscars, ever since the first 911 rolled out, the German manufacturers have produced cars that are fast yet reliable, you can drive them to work everyday or out on a holiday if you like. But in India, this is only a dream, we live in an SUV country and if you have to drive a Porsche, the Cayenne diesel is the best bet. Now there is a new Porsche in town, the smaller yet capable SUV, the Macan. Porsche claims this is the sportscar among SUVs. This means it combines sportscar and SUV DNA. 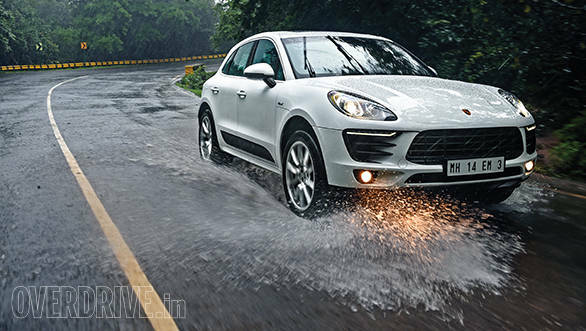 Is the Macan then the most practical Porsche for India? Look at the Macan just once and it's unmistakably a Porsche and nothing else, some may mistake it for a Cayenne but in the flesh, the difference in height is obvious. The Macan however is surprisingly wider than its bigger brother. The face is very similar, the signature new design, Porsche 918 inspired headlights with four-pot daytime LED lights are present while the front grille and huge air inlets give it a very familiar Porsche SUV look. But move around the SUV and the design is fresh and unique. The sides flow smoothly and there is no interruption in the form of an air vent or use of strong shoulder lines. The coupe like roofline is noticeable while the waistline moulding is unique and dynamic, it is quite prominent and almost takes up the entire lower section. The LED tail lamps are futuristic and yet not too loud, it's a new design that is similar to the 918 Spyder. You may wonder why I'm talking about the tail lamp despite viewing the SUV from the side. As Suresh pointed out while shooting these lovely pictures in the rain, the entire tail lamp can be viewed even from the sides because of the rear curvature design. The optional 20-inch wheels are a piece of art and give the SUV a sportier look like the black rear spoiler. The rear end is probably the angle that is entirely different and unique. The new sharp tail lamps and the flat tail-gate with just the Porsche and Macan badging does help it stand out and add a lot of character. To keep the clean and uncluttered look, the boot release button is even hidden under the rear wiper. The model seen here is the Macan S diesel but it still gets a rear diffuser and quad-exhausts that look like they came straight off the 911 turbo. 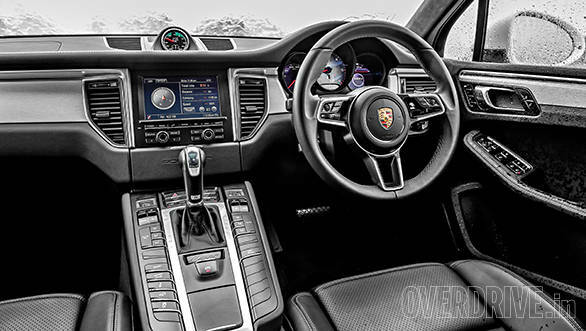 Step inside, and like the Cayenne, one is greeted by a spaceship like cockpit featuring plenty of buttons and switches that are placed for a reason. The interior is built really well and the attention to detail is top-notch. It doesn't feel like you're seated in an SUV at all and since the standard ride height is slightly more than a regular car's, it adds to the feeling all the more. Once you're seated, the typical Porsche instrument cluster is in focus, there are fewer dials than the Cayenne but almost all the info you need is displayed, and like in all Porsches, the tachometer takes centre stage. The new three-spoke steering is a delight to grip and goes well with the theme, the paddles and controls are placed perfectly too. As mentioned earlier, there are a plenty of switches especially on the centre console extension, all of which are easily accessible and help choosing the various modes and settings. The rest of the interior features a flat all-black dashboard with optional contrasting elements. Apart from the high-resolution display on the speedo, the centre also features a standard 7-inch touchscreen that also displays drive data as well as navigation and several other features. The standard stereo features 11 speakers but the optional Bose surround system includes 14 speakers that are placed all around the car, a subwoofer is part of this package too. 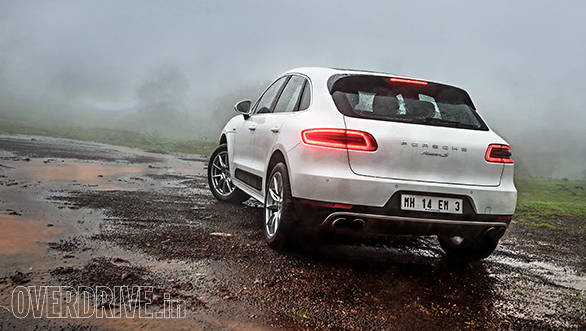 The Macan is available in India in both petrol and diesel variants, we tested the latter which we think will be the more popular variant in India. The 3.0-litre turbo diesel motor is the same unit used in the Cayenne diesel and Audi Q5. Power output is slightly lower than that of the Cayenne but exactly the same as the Audi's. Max power of 245PS is produced between 4,000 and 4,500rpm while max torque is an impressive 580Nm that is available from as low as 1,750rpm. This diesel motor is one of the most refined V6 units around and doesn't drive like an oil burner. In fact, the engine is as eager as a petrol and is quiet too. Porsche has tuned the motor differently, turbo lag is minimal and there is power whenever you need it in any situation. 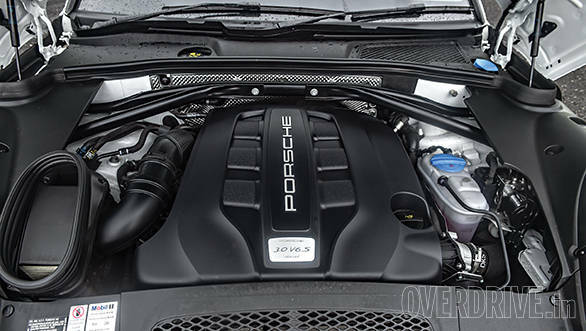 The engine fits the Macan's character very well and to make things better, is mated to Porsche's PDK transmission. The seven-speed twin-clutch unit is offered as standard and is super quick at gear shifts with almost no interruption in power delivery. There are paddle shifters mounted behind the steering (thankfully not the push-pull type) but I didn't really need to use them, thanks to a well tuned transmission. If you do use them, shifts can be made without any delay and it will keep you occupied, not to forget I'm still driving in the standard mode. Press the small button on the centre console that reads Sport and the Macan will get aggressive. The engine map here is different and becomes even more responsive, throttle control is harder to master in this mode but put the pedal to the metal and the engine revs quicker and the shift points are moved to the redline. Gear shifts from the PDK are even quicker especially while downshifting and the engine note gets more bassy too. The Macan S we tested even featured the optional Sport Chrono package that elevates performance to another level. This package further alters the chassis, engine and transmission characteristic and can be activated by pressing the Sport Plus button. Gear response times are shorter, shift points are further optimised, the idle speed is higher while the rev limiter is at the highest point. Launch control is also included in this package, we do test a lot of performance cars using launch control but the Porsche system is probably the most easy to activate. Simply press the Sport Plus button, press the brake completely using the left foot, hold the accelerator down fully and let go the brake when the 'launch control active' symbol pops up! It's that simple. 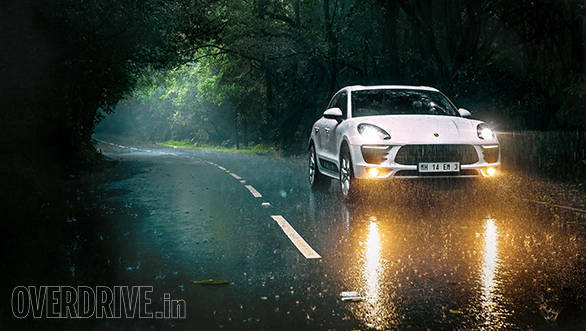 The claimed 0-100kmph figure is a quick 6.1 seconds, however in our test conditions, the Macan S hit the 100kmph mark in 6.5 seconds, super impressive considering we tested in moist conditions, not to forget, the SUV is diesel powered and weighs close to 1.9 tonnes. 200kmph comes up effortlessly and if the road permits, a top speed of 250kmph can be achieved. Fuel efficiency is impressive too, in town the Macan S returns 7.9kmpl while on the highway, the figure increases to 12.2kmpl. So the Macan S can cross the quarter mile in 14 seconds and still boast of a 600km fuel range. Great power goes well with great dynamics, Porsche are gurus at both and the Macan S is their latest example. As mentioned earlier, the Macan isn't light for its size, the bootlid and bonnet are made up of aluminium but the SUV is still a heavyweight. The all-wheel drive system uses the same concept seen in the 911 Carrera 4, this system along with torque vectoring offers sportscar like agility, electronics are plenty and Porsche have made full use of technology along with a balanced chassis and air suspension to create one of the best handling SUVs ever. The rear wheels are always driven and if needed 100 per cent of the torque can be sent to the front axle. The automatic brake differential can even detect if a wheel is spinning and accordingly, brake the wheel and transfer more torque to the other wheel. The Macan even uses an electro-mechanical power steering that is surprisingly direct and precise. Despite running optional 20-inch wheels mounted on low profile tyres, the Macan's ride quality is one of the best we've come across in an SUV. Air suspension that is an option internationally is offered standard in India. The suspension is height adjustable making it perfect for high speed driving or off-roading. 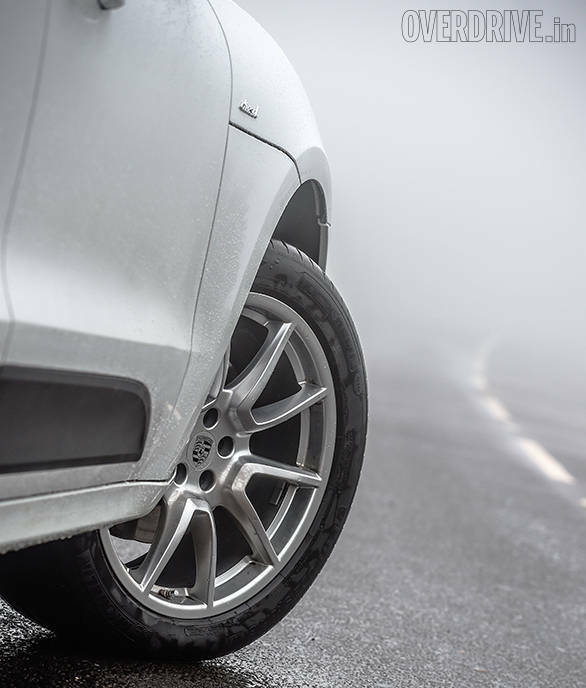 The ground clearance can be adjusted to three levels with a maximum clearance of 230mm. The Macan S is indeed an impressive machine and is a perfect fit for India. It's a sportscar that offers great performance, good fuel efficiency, SUV ground clearance and a ride that is impressive on Indian roads. 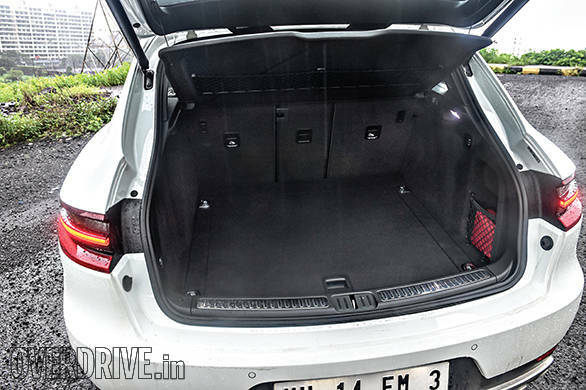 Not to forget, a 500-litre boot and luxury car features. But then there's a catch to this story, the Macan sold here in India is the top of the line variant that, as mentioned, comes loaded with all the bells and whistles and is priced at Rs 1 crore, ex-Mumbai. This makes it a shocking Rs 15 lakh more than the larger Cayenne diesel. Internationally, the Macan S is available in two other lower-end variants but for reasons unknown, both aren't available in India. 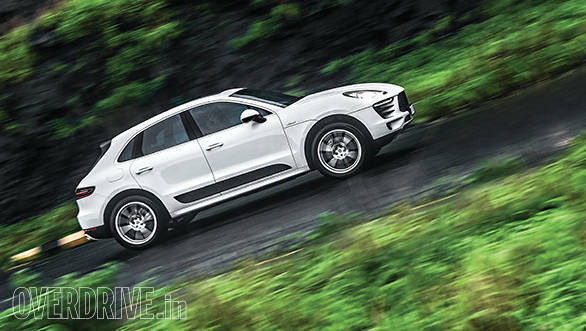 If Porsche offered these variants here and priced them lower than the Cayenne, the Macan would easily be the most practical Porsche for India.